If you love baking, here’s a great giveaway for you! The Cupcake Company, based in Letchworth, is very kindly giving away a host of baking goodies to the lucky winner. 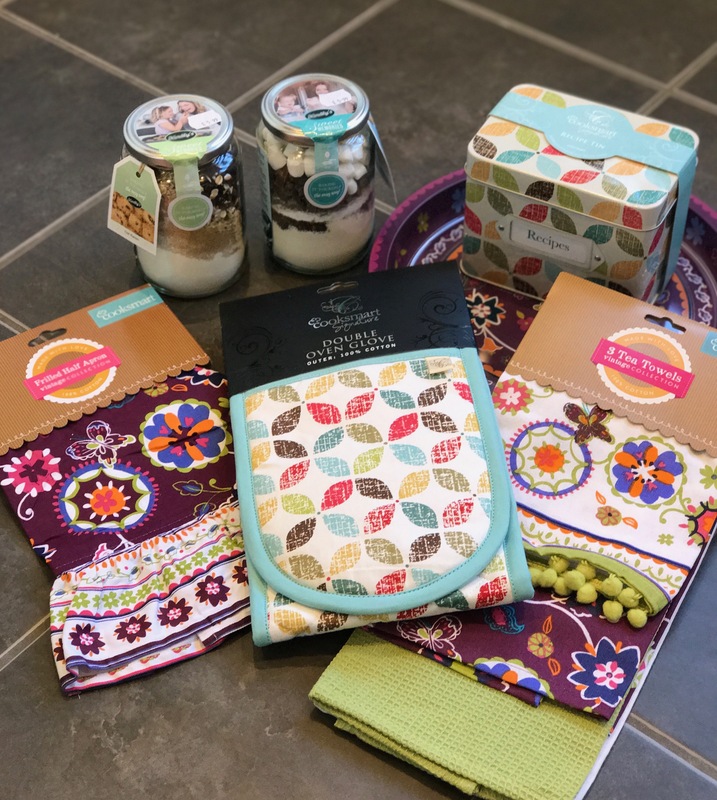 This fab prize includes: oven gloves, apron, tea towels, recipe tin, tray and two easy-bake kits. To enter, all you need to do is comment below on this post and tell us your favourite type of cake to bake! The closing date for this competition is midnight GMT on Friday, 26 May. Full terms and conditions of entry are listed below. Open to UK residents over 18 years old. This giveaway will run until midnight GMT on Friday, 26 May 2017. Entries submitted after this date will not be eligible to win. The winner will be selected at random and notified within seven days of the competition closing. The prize is as stated in the competition and cannot be substituted. The winner’s name may be announced on the Mums Off Duty website and related social media channels. Yum! Thank you for entering Jo! Got to be carrot cake. Thanks for entering Hannah, good luck! Ha! Both sound delicious. Good luck! Jumbo muffins. I found a great recipe online which seems to work really well every time I’ve baked it, resulting in huge coffee shop type muffins. Chocolate is always good. Thanks for entering! Raspberry vanilla cupcakes or classic brownies. Way too difficult to chose just one. I know, too many to choose from! Good luck Sarah! Delish! Thank for entering, good luck Justine. I love to bake double baked new your cheesecake! Mmm! Good luck, thanks for entering Ruth. Chocolate is my fave too. Good luck Steph! I love to bake a bakewell tart to enjoy with homemade custard! My mum used to make homemade custard but I’ve never tried it. Maybe I should! Thanks for entering Tracy. Such a classic! Thanks for entering Kim. Yes! I haven’t made them in years though. Thanks for entering Jean, good luck. Classic! Good luck in the giveaway Nicole. Thanks for entering, good luck. Good luck Liz, thanks for entering! I love baking a good Victoria Sponge with Jam and Cream, then i love adding fondant icing and creating something special for somebody. Sounds good! Thanks for entering. I absolutely love baking pineapple upside down cake! not only it it super sweet and moist, it’s really fun when you turn it out from the pan! Wow that sounds amazing, and tasty! Good luck. It has to be carrot cake every time! delicious! I love to bake a Greek yoghurt chocolate cake with chocolate yoghurt ganache. It’s so moist and light and using coconut oil makes it tastes even better! Yes, coconut oil is amazing! Good luck! Chocolate cake, a good moist gooey one. Love chocolate! Thanks for entering. My favourite is a vanilla & strawberry cheesecake! My ultimate guilty pleasure. Don’t feel guilty! Good luck! A good old fashioned victoria sponge or lemon drizzle. It has to be a Victoria sponge cake. I love baking with the kids. Our favourite cake to bake is a chocolate and vanilla marble cake. Gosh that’s quite a difficult one to answer as I enjoy making lots of different cakes. One that’s very easy to make and always turns out very well is a chocolate and almond cake. I love baking a chocolate truffle cake ! I love to make old-fashioned seed cakes or lemon madeira. It has to be carrot cake. Love the icing the most! christmas cake as its a once a year event and makes the house smell like christmas. Hi Val, you have won the competition! Congratulations! I’ve sent you an email with the details. Congrats again! Victoria sponge cake with jam, buttercream and icing……I could just eat some! I love making coffee cake. It makes the house smell amazing! It has to be a lovely lemon drizzle mmm! Carrot cake. It is the best cake. My favourite cake to bake is coffee and walnut cake! I love baking my mother in laws Carrot cake recipe. It is amazing! Has to be lemon and poppy seed for me. I love chocolate fudge cake I have to make one every week for my Grandsons. Cherry cake is my favourite and because my kids don’t like cherries, I get to eat it all myself which is really naughty but tastes great. I love baking Victoria Sponge, I like to decorate it with fresh strawberries. I love to make double chocolate gateau. I learnt to make it at school and has since become make favourite cake to bake. Me and my daughter do a fab malteser cake. It is very yummy, and Amber stirs it for me! My favourite cake to bake is a Victoria sponge. With 14 hens we always have a good supply of tasty free range eggs! Yum! Can’t go wrong with a victoria sponge! Lemon drizzle cake. And the oven gloves you are offering match my apron! A simple victoria sponge. I’m still a novice when it comes to baking! Carrot cake all the way!! Lemon cake is my favourite to bake. Courgette an Lime cake, it’s far more zingier than a carrot cake. Welsh girl here, so got to be bara brith! I love baking a good old Victoria Sponge! The good old Victoria Sponge with fresh cream and a dusting of icing sugar. Gluten free Victoria sponge cake for a special family treat. Our family has many Coeliac sufferers so there is nothing nicer for them then a fresh slice of gluten free cake now and again. My favourite cake to bake has to be coffee cake with its butter icing inside and on top and decorated with walnuts. Salted caramel cupcakes with salted caramel butter icing. Yum! My favourite cake to make is ginger cake. A deliciously moist coconut cup cake with a cream cheese topping, gorgeous!! It has to be my cherry and amaretto chocolate brownies, they always seem to go down well! I love baking red velvet cupcakes or chocolate brownies! Definitely coffee- yummy, with chocolate topping! I love making fruit cake – it reminds me of baking with my Mum and Grandma when I was little! Lemon drizzle cake. Simple to make and tasty. Victoria sponge, so satisfying getting an even rise. A moist banana cake! There isn’t enough of it around in my opinion!!! its got to be a coffee and walnut cake!! Banana and chocolate cake is my go too because it’s so simple to throw together! If I’m making an effort than my fave to make is a decadent chocolate cake! Chocolate with a little coffee. My favourite cake to bake is a Hummingbird Cake – easy but delicious and the whole family enjoy it! Coffee and Walnut cake is my favourite to bake…..and eat! Chocolate chip with vanilla icing. I’ve always liked pineapple upside down cake as It was the first one I learned. Delia’s flapjack with extra syrup for gorgeous gooey-ness – easy peasy and never goes wrong! I make some yummy vegan vanilla cupcakes, even non vegans love them. Coffee and Walnut – a family favourite! Butterfly cakes filled with homemade rasperry jam and whipped cream and sprinkled with a dusting of icing sugar. Lovely with a pot of tea. I adore coconut sponge. It’s so yummy. Or my second choice is a custard tart. Love making my children the hedgehog cake – chocolate sponge, chocolate icing and either flakes or matchmakers as the spikes! I absolutely adore rhubarb, orange, ginger and almond cake. Yum! Salted caramel cupcakes are my favourite – although anything with buttercream icing makes me swoon. Great contest. Mini red velvet cupcakes with vanilla buttercream! I can make over 100 in one go! Chocolate fudge cake is my all time favourite to bake. Mine is a chocolate cake… so I can lick the bowl haha! My favourite cake to bake is Lemon Drizzle cake as it’s always a winner with my family and friends. I’m rather partial to a coffee and walnut cake! Would you like a slice? My favourite cake to bake is a plant based banana and amaretto cake. Yum! I love to bake a pumpkin spice loaf. Fresh Cream Sponge topped with strawberries. Love coffee and walnut cake, might have to put it into cupcakes with walnut on the top, yummy! I love to bake either carrot cake or a chocolate Guiness cake – both delicious and moist! Chocolate olive oil cake. Yum! coffee cake is my absolute favourite to make and eat! Battenberg cake. Nostalgic, pink and square. To make has to be a strawberries & cream type – usually victoria sponge, although cupcakes can be a dream. Eating on the other hand… definitely triple chocolate! Lemon drizzel cake is my favourite to bake. Lemon drizzle is my favourite! I love to make a Guinness chocolate cake.. its so rich and moist and the whole family loves it! Salted caramel cake, absolutely wonderful on its own, or with cream as a dessert! I like making a Victoria Sponge or a Lemon Drizzle cake. My Favourite cake to bake is Lemon Drizzle cake. I love baking a classic lemon drizzle! My Gluten-free, vegan, Cherry and Almond Cake. i bake alot of muffins and lately have been baking breakfast muffins for my tribe to walk to school with as none of them eat proper breakfast, ive made blueberry muffins and chocolate and lemon etc although i make a lot of muffins my actual favourite cake is chocolate, anything chocolate and im in my glory. (self confessed chocaholic) but i dont actually bake chocolate cake i always cheat and buy it. Double chocolate muffins are my favourite to bake. My current favourite is a courgette and lime cake! Perfect for summer and a glut of courgettes! Is a great big chocolate cake!!!!!! carrot and walnut cake with cinnamon frosting, its yummy! Pineapple upside down cake,a good old classic that’s perfect for this time of year,scrummy!!!!! and so Moorish. Don’t know if they’re really a “cake” as such but I love baking peanut butter brownies! I have a carrot cake in the oven right now but generally prefer making chocolate cake. I love making succulent carrot cake with sultanas, walnuts and cream cheese frosting, almost perfected!